These are the various measurements I’ve come across in my books. I’ve divided them into categories. By “common” and “uncommon”, I’m referring to their use in modern kitchens. These are measurements that were exact (most were regulated), and are the same as they are today. Tablespoon (1/2 oz liquid) Mostly dependable. Common then, uncommon today, but relatively dependable. Butter the size of a Walnut (2 Tbsp, or 1oz liquid) also seen, size of Butternut, Hickory nut. Cup – Today, this is 8oz. But at various times and places in the 19th century, it could be anywhere from 4oz to 8oz. If you’re really lucky, the book you are reading the recipe from will have a table of measurements that will specify. You’re usually not that lucky. Basically, until recently the “cup” was just not an official unit of measurement. Which is why it’s quite common to see recipes specify 1/2 pint. Teaspoon – Today, there are 3 teaspoons to the Tablespoon. Prior to the 1730, there were four teaspoons to the Tablespoon. 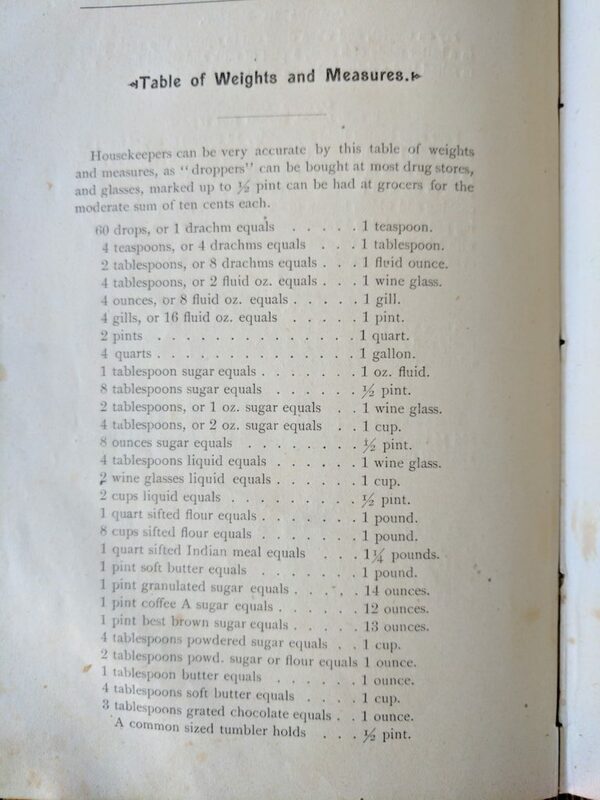 Table of Measurements from “The Pennsylvania Memorial Home Cook Book” In this book, a cup is 4oz. Woman’s Relief Corps, The Pennsylvania Memorial Home Cook Book. 1891.